This seems to be a new set, available at least at the Leicester Square store, but hopefully elsewhere. RRP is 99.99GBP, contains 4500 1x1 pieces in 4 shades of grey and 1 yellow, plus a 48x48 baseplate. I like it. I really do. I want it...but not at GBP100.....YIKES. Try buying these on BL ... cheapest excluding shipping for NEW plates is $205, across 4 stores, including international shipping. @DadsAFOL has enough if you want a single order, but count on spending $400. Suddenly 100GBP doesn't sound like a lot, unless you can get these from a pick-a-brick wall somewhere. Oh, and add $12 for a 48x48 baseplate (KMart.com) plus of course the brick separator, because nobody has one of those. I would say yes... the box has the piece count which is unusual for a European box. Thing is, they go together with a photobooth which prints your mosaic picture so you can recreate it. Wondering how they would sell these without the booth - though perhaps they'll have a service online where you upload a picture and it gives you a PDF with instructions? A 48x48 baseplate and just about all the 1x1 plates you could ever use. This would make for one heck of an art project for any kid. A little unfortunate the image will primarily be monochromatic outside of the yellow yet still I can see some tastefully creative designs utilizing such "limitations". The Leicester Square store is the 131st LEGO store globally and is pushing the boundaries with many unique LEGO® firsts. 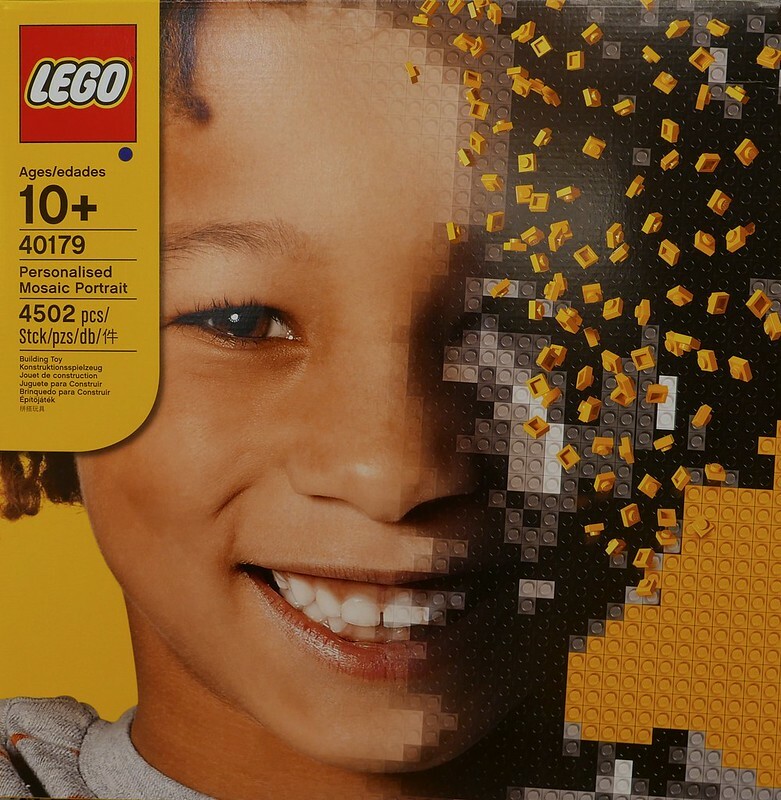 The largest LEGO store in the world boasts exciting new experiences, such as a ‘Mosaic Maker’ which offers LEGO fans of all ages the opportunity to purchase their very own, one of a kind, personalised LEGO mosaic portrait. 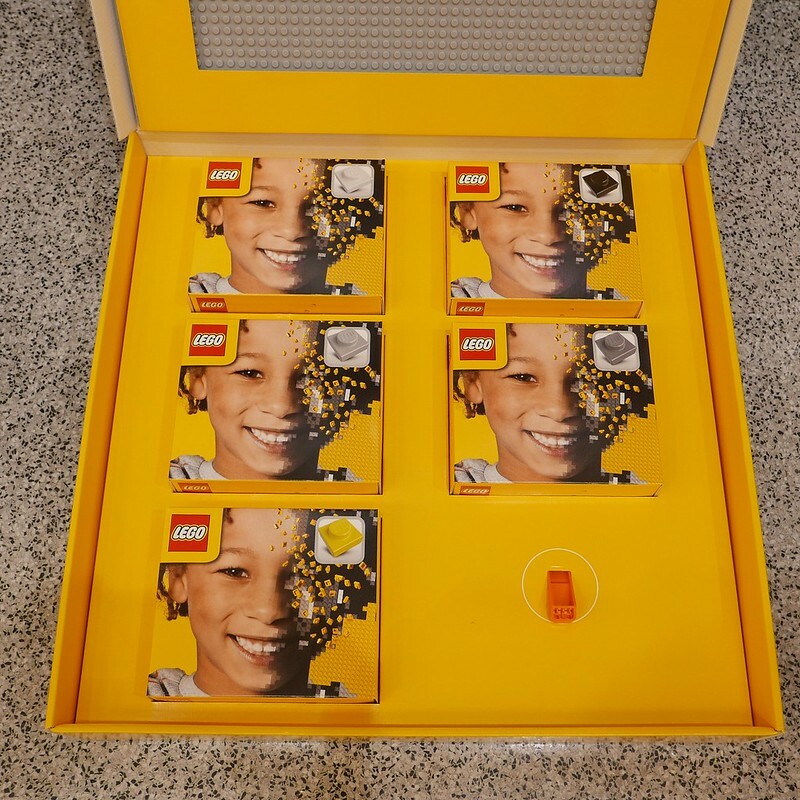 The machine captures your image and in under ten minutes printed instructions and the bricks required to complete the LEGO portrait are supplied to the customer. The London store is the first in the world to make this unique experience available. I'm thinking that if the service to make your picture into building instructions was free, I could then just go to the pick-a-brick wall and get a couple of cups of different colored 1x1 studs or plates and an extra baseplate. Could save over half the cost of the whole thing. Assuming the printable instructions were free or even modestly priced of course. I saw this in action at the Leicester Square store yesterday's. It is basically just like any photobooth you see anywhere around the world, except it delivers both a 1:1 print showing how to place the bricks and also the box which holds the 48x48 plate along with five boxes with the white, light grey, dark grey, black and yellow bricks (4,500 of them in total) and most importantly... a brick separator. The reality is that at £99.99 you couldn't BrickLink it any cheaper. The one in London is currently the only one in the world. The final result looks quite good. Oh and you can't get more than two people in at one time and even then the print doesn't get both faces in completely. Besides the photo being unique to every set (doesn't have to be, but it can), are pieces also being picked specifically for each face? More of this color, less of that? no, it contains exactly same amount of bricks I asked project manager about this and he confirmed me you will find stock amount of bricks in every set. this whole procedure of releasing a box is more like mystical experience. You mentioned that "you can't get more than two people in at one time and even then the print doesn't get both faces in completely". May I ask if 2 people is OK? I am thinking to do one for my 2 kids in one go. The booth used is very similar in size to a regular photobooth. It all boils down to how much of the printable image the two heads will take up. With two small children you may be able to position them for it to work. Has anyone actually had two people in the machine. I have only seen one example in searching the web and it worked pretty well with two halfs of each other's head together. My wife and I want to do it on our anniversary but when calling up I was told no. Thinking of seeing what the answer is on the day. Just called the Lego store. They are adamant that only one person can use the machine at a time. When I pointed out that I had seen a couple use the machine they said that was from when they started and that two people doesn't work as well and they don't have enough bricks. There is no promo on this set nor covered by any VIP promotional offer, so even when it's 2x VIP you will be left with nothing. ask someone to do the purchase for you, look at the youtube how in 3 easy steps make your picture mosaic in LEGO using photoshop. and you are good to go, unless you are planning to visit UK. remember there are 4k blocks in there, it's quite hefty. So scale your luggage adequate before your arrival lad. Good call regarding the weight, as I'll be flying without checked bags. And that leads to a question...what IS the weight of this thing? Nothing on Bricklink or Brickset. about ~2.5- 3kg. Box is square and rather flat.